You have survived Bout of Books 24! 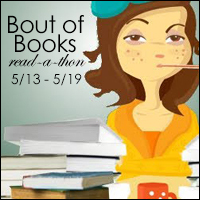 Bout of Books 25 will be from May 13th to May 19th. Thanks to Emma (Words and Peace) for today's challenge. You are hosting an intimate dinner party for five of your favorite characters. Who do you invite and what food do you serve? Thanks to Emma (Emma Reads Things) for today's challenge! Welcome to Bout of Books 24! Example: "Needed for survival: books, dogs, coffee."